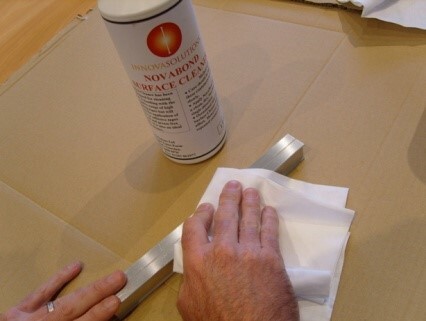 To obtain the best results using NovaBond High Strength Bonding Tapes, surfaces must be clean, dry and free from oil, grease and any other contaminants that will be detrimental to accepting adhesives. If the surface is excessively soiled, wash with a detergent solution and dry thoroughly before proceeding. We always recommend abrading wherever possible to ‘key’ both surfaces – tooling up for this will preserve the aesthetics of the sign where it is an important consideration. This can increase the surface area and enhance bond strength by up to 30%. 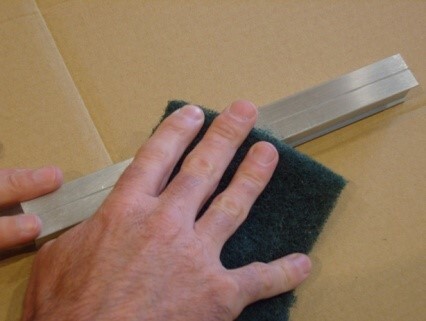 Subsequent cleaning with a non-residual cleaning solvent such as Novabond Surface Cleaner will further assist the adhesion of the tape to the substrate surface. Ensure that the solvents use is in accordance with manufacturers recommended guidelines which are available from Innova Solutions. For increased bond strength, the surface can then be treated with NovaBond Surface Primer which acts by polarising and increasing the surface energy of the substrate at the bonding interface to more readily accept adhesives. It is particularly useful in bonding metal signage which is subjected to severe external environments such as road traffic signs or signage prior to high temperature powder coating or stove enamelling. NovaBond Surface Primer enhances performance in-situ at both extremes of temperature. The primer will also enhance the bonding ability of galvanised steel, powder coated and epoxy coated metals and low surface energy plastics. Bond strength is dependent upon the degree of adhesive to surface contact developed. Firm application pressure develops better adhesive contact and thus bond strength is improved. After application, bond strength will increase as the adhesive flows into the surface. 60% strength will be achieved within 20 minutes, 90% after 24 hours and 100% after 72 hours. Ultimate bond strength can be achieved sooner by exposing bond to higher temperatures (e.g. 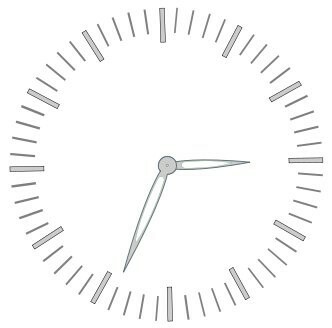 70°C for 1 hour) or by applying more pressure (via a laminator or placing weight on the bonded parts). Achieving the optimum thickness is best done by opting for the thinnest possible product that will give 100% surface contact between the two substrates and the adhesive surface. This will give greater shear, peel and tensile strength. Examine the substrate surface structure for irregularities and consider the amount of flexing that the sign / panel will be prone to i.e. the greater the dimensions, the more flexing will occur. This will also be increased when bonding dissimilar substrates that expand and contract at different rates. Choose a thicker product to accommodate this and the greater flexing in service. ABRADE – Where possible abrade the surface to provide a ‘key’. CLEAN – Clean surface with NovaBond Surface Cleaner. 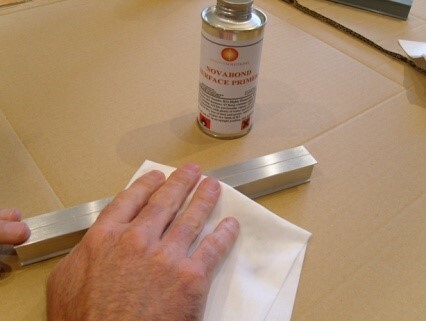 PRIME – If necessary, prime surface with NovaBond Surface Primer. PRESSURE – Apply NovaBond with the use of a NovaBond roller applying firm pressure. 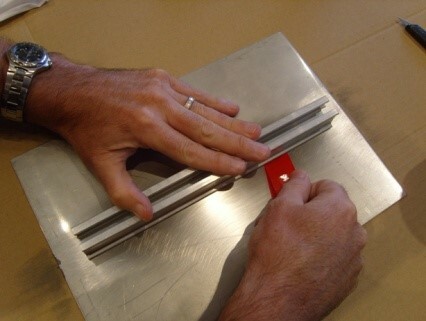 JOIN – Remove liner, line up the parts and apply second substrate. PRESSURE – Again apply firm pressure to the bond with the NovaBond roller. TIME – NovaBond will continue to flow and build up strength reaching Ultimate Bond Strength in 72 hours. Minimum Temperature: 10°C– At temperatures below 10°C, the NovaBond becomes firmer and condensation will form on substrates. NovaBond SignFix XS110W and SignFix XS100C can be applied at lower temperatures but condensation must be removed immediately prior to bonding and prevented from reforming by heating the substrates above 10°C with a hot air gun. Surfaces Requiring Priming: Independent tests at Loughborough University have shown the primer to increase bond strength by over 50% so, for best practice, we recommend priming all substrates prior to bonding. For visibly clean substrates, the NovaBond Primer will act as a one-step clean & prime (NB Always clean aluminium thoroughly before priming to remove ingrained oils and oxides). Low surface energy plastics, plasticized PVC, galvanised steel, copper and brass must always be primed. Prime glass with Silane Glass Primer. If in doubt, prime the surface. Surfaces Requiring Sealing: Most porous surfaces e.g. concrete, stone, screed and wood, will require sealing with a suitable propriety primer to unify the surface integrity. Because NovaBond tapes are visco-elastic by nature, their strength and rigidity is a function of the rate at which they are stressed. This means that they tend to react stronger and with more resistance under relatively faster rates of stress load (dynamic stress forces) and tend to demonstrate greater creep tendencies with static loads over longer periods of time. As a general rule, and we cannot be specific for every substrate, a 6,000sqmm area of tape (eg 80mm x 75mm), when applied correctly and allowed to attain ultimate bond strength, should be used to support each Kg of weight without excessive creep. Under shorter term static shear and dynamic shear forces, we have demonstrated that a 625sqmm area of tape (eg 25mm x 25mm), properly applied and at ultimate bond strength, will hold a 1 Kg weight. Because of the points afore mentioned, however, regarding long term static loads and their effect on creep, we would always suggest building in safety margins to accommodate and allow for any detrimental movement over time. As a general rule-of-thumb guide, when using 25mm wide tape, we would recommend a minimum length of tape of 240mm per Kg of weight. For shear applications such as mounting signs vertically to structures or walls, the flatter the panel and the more flush the fit to the wall, the more the shear force is acting on the panel. Thus we would recommend applying the tape down both vertical edges and for wider panels and signs, one strip vertically down the centre or spaced at equidistant centres accommodating the width of the panel. The more 3-dimensional the sign or panel, the more susceptible it will be to a low-angle peel force. In order to resist this action on the sign, apply tape around the perimeter and then strips vertically equidistant across the panel width. When bonding to clear acrylic or glass where reverse aesthetics are a consideration, choose SignFix XS100C. These products are water clear, high performance, extruded acrylic bonding tapes. Select the right thickness of product according to the dimensions and surface structure of the substrates to be bonded. These products exhibit excellent initial tack and ultimate bond strength on a variety of substrates including clear acrylics and glass. They will perform under the harshest environmental conditions where there is movement due to dissimilar expansion and contraction or high winds. When bonding lettering onto glass, ensure both the surface of the glass and the rear of the letter are cleaned with NovaBond Surface Cleaner and the rear of the letters are primed with NovaBond Surface Primer (unless they too are glass, where we recommend Silane Glass Primer). If either the letter or glass are excessively soiled, clean well with soap & water and dry completely prior to cleaning with the NovaBond Surface Cleaner. We always recommend applying the tape to the lettering first, where possible, under shopfloor conditions where cleaning is easier, the ambient temperature is more controlled and the tape has a chance to bond well into the surface prior to fixing to the glass. 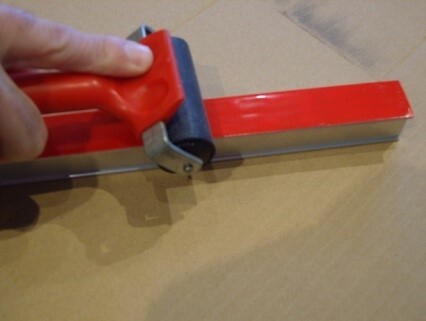 You may find it easier to roll out the tape and apply the letter directly onto the exposed adhesive. 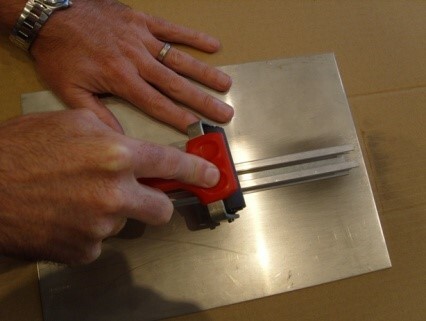 Cut round the letter carefully with a sharp scalpel or knife and then turn the letter over and apply firm pressure by means of a NovaBond Roller or laminator to expel any trapped air bubbles. At low temperatures, there is a risk of condensation forming on the surface which will prevent bonding. If this is the case, apply gentle heat from a hot air gun in order to warm the surface to above 10°C taking care not to overheat and crack the glass. Glass can be a difficult surface to bond to as it is very flat and smooth but can trap impurities and moisture in the fine surface pores. For this reason we always recommend priming with Silane Glass Primer allowing this to dry and act, either naturally, or by speeding up the process in cold temperatures by, again, gently applying warm air. This should only take a matter of minutes before it is possible to apply the lettering whilst the glass surface is still warm and condensation has not had chance to reform on the surface. Start to remove the liner (around 50 – 75mm) and peel out to the side of the letter , line up the letter correctly, and then applying firm pressure, preferably from one side of the letter in one direction so as to avoid trapping any air bubbles, peel out the liner. Again it is better to use the roller to achieve uniform pressure over the whole of the letter to ensure 100% surface contact between the letter and the glass. It is probably worth making up some removeable markings to ensure that the letters are correctly aligned prior to fixing as the adhesive exhibits good initial tack and removal of a mis-aligned letter may result in damage. If the glass has cooled down in-between fixing other letters, re-apply gentle heat before fixing each letter. On applying the letter with firm pressure, the resulting bond will achieve around 60 – 70% bond strength and this should be sufficient to support the weight of the lettering. The adhesive will continue to flow, however, reaching ultimate bond strength in 48 – 72 hours. If in doubt, apply some strong masking tape to support the letters until the NovaBond has achieved ultimate bond strength. The values presented in this document have been determined by standard test methods and are average values that should not be used for specification purposes. Our recommendations regarding the use of our products are based on tests considered by INNOVA SOLUTIONS to be reliable, but the customer must conduct his own tests to determine the suitability of the product to the individual application and requirement.